Its the time of commercial movies that were the choice of public before a few years. Call them a masala film exploring larger then the life characters where a typical hero is capable to fought a bunch of villain’s henchmen single handedly. The people knowing the fact that it is not possible in real life keep enjoying the same though. The reason was and is obvious; in the time when there are tons of hurdles in the real life makes it harder to live; one needs to see some miraculous hope and want to get away from the reality, at least for the few hours. The time is moving like a circle and along with so many path breaking movies or real-life or incident based movies, there comes a lot of fully-loaded masala movies and makes their impact too. Also the trend of making the hit South-Indian films available to Hindi movie watching public, as remake, is in full-throttle though. A few recent examples include Ghajini, Wanted… and movies like Dashavatar, Raavan, Robot being made in more than one languages. A Suriya starter hit South Indian movie Singham is what fascinated Rohit Shetty who made comedy movies like the Golmaal series, Sunday and All the best. He was working on the other movie (Bol Bachchan?) and in between purchased rights for Singham and made it in the short period of around six months. Story remains almost same as was in the original film, some changes are though to appeal the viewers of Hindi cinema as the likes and dislikes of the viewers of target audience of the original movie are different than those of viewers of Bollywood movies. It is the story of Bajirao Singham [Ajay Devgan] a police inspector in Shiv Gadh, a village near the border of Goa and Maharashtra. 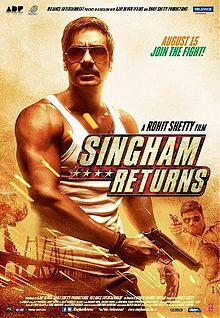 Singham is a different kind of cop who is having his own way to tackle the crime and maintain peace. He uses more of his wisdom and humanity then the power and position in order to do so. He wants the people of his village live like a family and at the same time he doesn’t tolerate the anti-social stuff or criminal activities by all means. An outspoken girl from city, Kavya Bhosle [Kajal Aggarwal] comes to the native – Shivgadh – along with his father [Sachin Khedekar] and falls in for Bajirao who bravely fought the goons who misbehaved her in a theater. Well, till there is no villain, there is no need of a hero. The movie starts off with the death of a genuine, honest and brave police officer who got disturbed by the false charge of corruption he is blamed with. Her wife [Sonali Kulkarni] seeks justice and contacts almost all officials and leaders who have the power but felt dishonored. Jaikant Shikre [Prakash Raj] was behind the incident. Jaikant was the ruler of Goa in one way, he was doing all the illegal activities he can, flawlessly. There is no one who can stop him or go against him. There comes a fate, which gets crossed the path of Shikre and Singham. Shikre needs to go to Singham’s police to sign up for a document. He sends his men to do the same. Singham asks them to send Jaikant himself. Jaikant comes with a gang and tried making impression on Singham but was completely overpowered by the people of the village who were ready to do anything for Singham. Hurt and frustrated Shikre gets Singham transferred to Goa, his own kingdom. He tries making Singham’s life harder by all the means. How Singham overcomes the hurdles? and what path his love life take then onwards?, is the heart of the second half of the film. Its a typical masala film, which belongs to genre of typical south Indian masala film. Devgan beefed up himself and the posters are showing his hard work. Sometimes you see that in the film the actor inside him takes a back seat, but he is in the form no doubt. Kajal fails to create a positive impression. Ashok Sharaf is seen in such long and meaningful role after long [I remember Karan Arjun as the movie which has his last remarkable role, before this one]. Prakash Raj who had shown a few typical expressions in Bbuddha Hoga Tera Baap, gets scope here and show his abilities. Of course you can see the stamp of typical south Indian masala film and their actor’s attributes in most of the film. Sachin Khedekar is wasted. Melody takes the backseat in the film and there is not much to talk about. The action sequences are worth mention, it is a nice combination of Desi fight mixed with Hollywood techniques. Overall a typical masala film which you watch for full entertainment. Though there are heavy action sequences which makes it a movie to watch in the absence of minors. 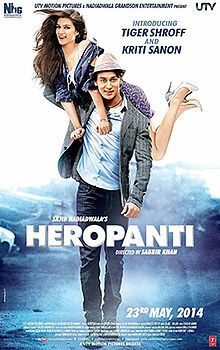 If you are fan for commercial, typical, masala… Bollywood films, just go for it and you will not regret.